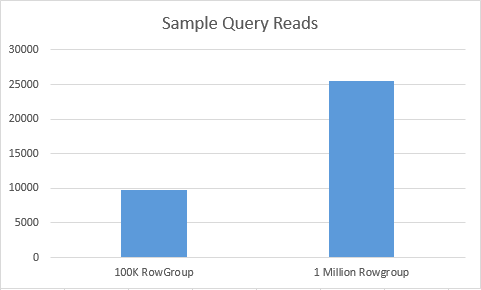 What is better for SQL Server performance: to have a big Row Groups (1.045.678 rows) or to have them as small as possible (100.000 rows) or maybe even less ? This blogpost is about discovering if the most obvious answer on this question is actually the correct one. First of all, please do not forget that the unit of any reading operation when using Clustered Columnstore Indexes is a Segment (as long as you are processing data from the Segment, in the case of Deleted Bitmap or Delta-Stores the story is pretty much different). It does not matter how many rows you are going to read from the Segment – just 1 row or the 1 Million rows, you are going to read each and every page & extent that are storing your Columnstore Index, which is pretty much expensive. If you are using a predicate on the non-presorted column and you are needing the not that much data out of the most segments, then you just might be doing quite a big number of unnecessary reads. Of course in the real life you will be doing Segment elimination not only on 1, but on each and every column predicate, but in the case whenever you are working with a Table that contains billions of rows, you might be doing some very serious unnecessary reads. The difference in sizes in our case is not that dramatic – we have 172 MB spent on our original table with the maximum number of rows at the Row Groups (1045678) while the smaller sized Row Groups occupy 192 MB, which means just a 20 MB difference. The difference in the number of Row Groups is quite significant – we have 100 Row Groups for one of the tables and just 13 for the other, which is ~8 times less. The actual maximum number of rows per Row Group for the FactOnlineSales table contains 1045678 rows and for the FactOnlineSales_SmallGroups table is just 131073 rows big. I will use the amazing SQL Sentry Plan Explorer tool (you can download free version), which unfortunately does not understand Columnstore Indexes, but hopefully will be fixing this 2 year gap very soon. Now this is interesting, because according to this information, the first execution plan is slower than the second one – the CPU time is bigger, the duration time is bigger as well, the number of reads is actually much much bigger for the table with smaller number of Row Groups. Even if we remove statements cleaning out pre-cached information, the final result according to the Execution plan statistics will remain the same. If we look at the Statistics IO, we shall find the the number of the reads (logical as well as the combined – 25460 reads vs 9730 reads) is quite superior in the case of the first table, and while the final execution results might vary significantly, right at the very first attempt we have managed to find the case where having more segments is actually an advantage. Important Note: I guess that there is some sort of mistake when reporting the reads because there is no such difference in the compared table structures. 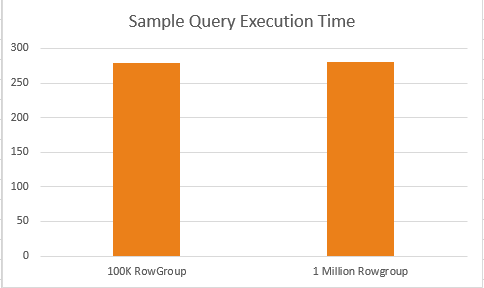 When checking on the execution times, we can see a very slight and insignificant different between execution times – 279 ms for the 100 Rowgroups Table vs 281 ms for the 13 Rowgroups table. I have executed those queries multiple times in order to make sure that the data is not a simple outlier, and on my test VM the results are very consistent. Oha ! So actually, underneath it all we have a situation that even though our 100 segments should be hosting massive amounts of data compared to just 13 segments, in the reality they occupy a little bit less space (1.3 MB) as you can see on the picture above. This is where we can see the difference between 2 tables, the dictionaries sizes for the FactOnlineSales_SmallGroups which has 100 Segments is definitely much bigger than the dictionaries sizes for the FactOnlineSales containing just 13 Segments. The missing part should belong to such internal structures as Deleted Bitmaps, and as far as I know there is no way to consult its size or content directly. Unless of course someone will find a cool way with some internal function, such as DBCC CSIndex. The dictionaries for the columns used in our test query are extremely small and they do not represent the actual weight of the dictionaries. We can look at them and notice that on some columns there are quite a number of local dictionaries, corresponding almost to each of the existing Segments. SalesOrderNumber is the column that uses the most space for the dictionaries and had we used it in our query, it would definitely increase the amount of memory required as well as the amounts of memory required to process the query. As you can see, even if we would scan the whole table without any predicates, so many things would depend on the actual columns used. Having smaller Row Groups can have its own advantages, you will need to test it in order to get a better understanding. Disclaimer: I believe that Microsoft has very carefully selected the maximum size of the Row Groups, doing a lot of research before selecting it, but as an IT person, I wish could have an opportunity to control it in order to achieve better performance. Let’s assume, I have 3,2 mio rows to load into a table with a columnstore index. Usually (particularly when I load this in batches) this would result in 3 rowgroups with 1,048,576 rows each and one open rowgroup with 54,272 rows. What would be the best / recommended option in this case? but in the end, I always prefer the Row Groups to be as big as possible and be similar in size. When they are equal, the query optimiser will be able to distribute work between cores in an easier way and guarantee that all of them shall finish at almost the same time. thanks for the quick answer, when I interpret it correct, you tend to option a) because of equal data distribution (which makes absolute sense to me, particularly because I did not think about it before). yeap – you put it perfectly! This is what the ultimate goal of the engine when building the Row Groups.